Teachers can present high-intensity demonstrations in rotational inertia or experiment with forces involved with a bicycle gyroscope with this Rotational Platform. 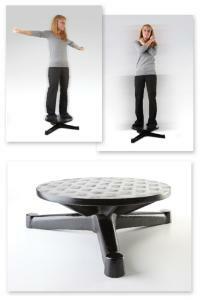 This heavy-duty rotating platform features a 43 cm diameter disk. The long legs make the platform exceptionally stable, and a grooved top ensures maximum safety. It measures 22 x 22" and weighs approx. 80 lb.